[SatNews] "It offers unmatched range and persistence... combatant commander demand for the RQ-4 continues to skyrocket. Operational success has led one theater after another to request support from this high-altitude, long-endurance aircraft." The U.S. Air Force's RQ-4 Global Hawk, a wide area surveillance unmanned aircraft system, has just completed its 100th operational mission in Southwest Asia and recently moved into the Pacific region. Built by Northrop Grumman Corp. (NYSE:NOC), Global Hawk is operated largely out of the 69th Reconnaissance Group at Grand Forks Air Force Base, North Dakota. The 69th Reconnaissance Group falls under the 9th Reconnaissance Wing, central station for the entire Global Hawk fleet based at Beale Air Force Base, California. Global Hawk is equipped with the Multi-Platform Radar Technology Insertion Program sensor capable of detecting fixed and moving targets. It has been flying early operational capability (EOC) missions since September 2013, providing the high priority wide area surveillance ground moving target indicator (GMTI) capability in the U.S. Central and Africa Command regions. Full system capability will be demonstrated when the system enters initial operational test and evaluation (IOT&E) in the spring of next year. Global Hawk GMTI EOC operations have proven the viability of the system, which expanded into the Pacific with two Global Hawk aircraft deployed to Guam to support U.S. Pacific Command peacetime surveillance requirements in the region. "Global Hawk delivers tremendous capabilities," said Col. Lawrence Spinetta, commander of the 69th Reconnaissance Group. "It offers unmatched range and persistence. As a result, combatant commander demand for the RQ-4 continues to skyrocket. Operational success has led one theater after another to request support from this high-altitude, long-endurance aircraft." 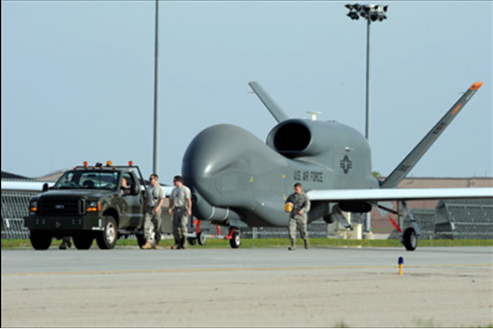 Global Hawk has flown more than 115,000 flight hours supporting diverse global missions. Carrying a variety of intelligence, surveillance and reconnaissance sensor payloads, Global Hawk supports antiterrorism, antipiracy, humanitarian assistance, disaster relief, airborne communications and information-sharing missions. Northrop Grumman is a major global security company providing innovative systems, products and solutions in unmanned systems, cyber, C4ISR, and logistics and modernization to government and commercial customers worldwide. Please visit for more information.